Michigan losses their first game of year on a last-second field goal at Kinnick. No really. I've had it up to here with celestial objects. You have to hand it to Iowa, they made plays. They played with emotion and gained the momentum early in the game when Michigan ran into their punter twice in a row to give them a first down. 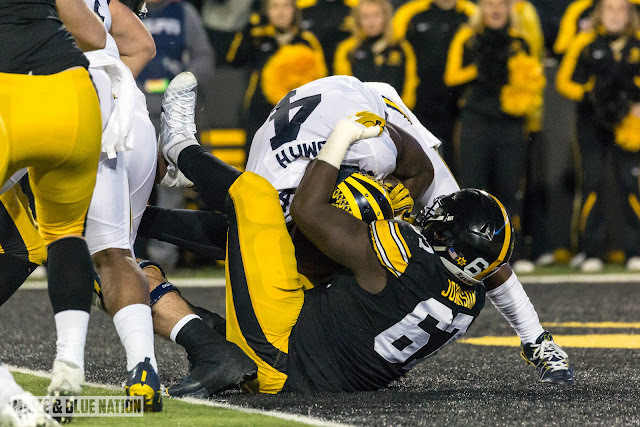 They gained even more momentum when De'Veon Smith was tackled in the endzone for a safety to make the score 10-2 Michigan midway through the second quarter. From then on, you just had this feeling that things were not going to go the way Michigan wanted them to go. Iowa didn't do anything spectacular to win this game, they just seem to be there long enough to capitalize on Michigan's mistakes. And those mistakes were plentiful. Dropped passes, poor blocking, the running game struggled to get anything going. Defensively, the edges were an issue again because that's Michigan's issue and everyone knows it. Iowa, who's running attack is ranked 93rd in the country, had Michigan on their heals just enough to move the ball when they needed to thanks in large part to Akrum Wadley and LeSaun Daniels Jr. who ran incredibly well most of the time. A lot of things come into question when you lose a close game like this. What was up with Michigan's running game? What was up with all of the drops? Why didn't Ty Isaac see the field again after his touchdown run? What is up with Wilton Speight who looked more and more off as the game went on? What was up with the run defense? Was Michigan blitzing too much? The simple truth is Iowa made plays and Michigan did not. There were times in this game when it seemed like Michigan was overthinking things. 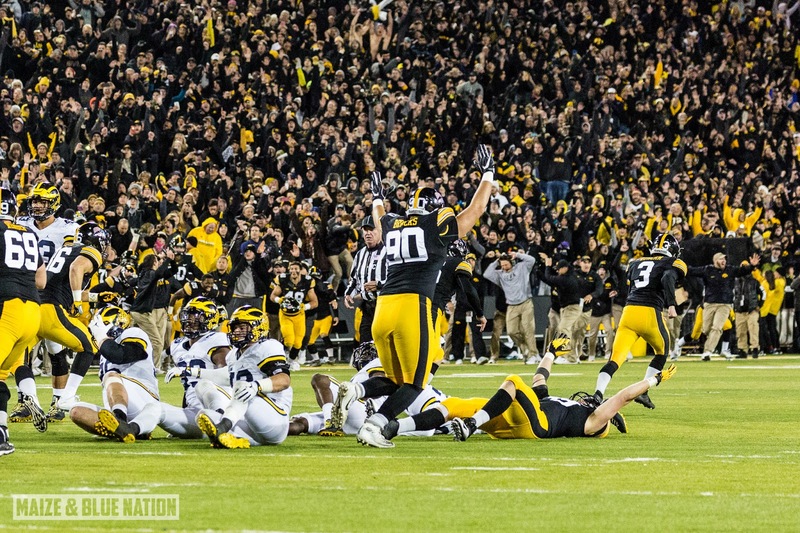 Kinnick Stadium has proven to be kryptonite for Michigan in recent years and last night was no different. This didn't look like the same Michigan team we've watched all year. 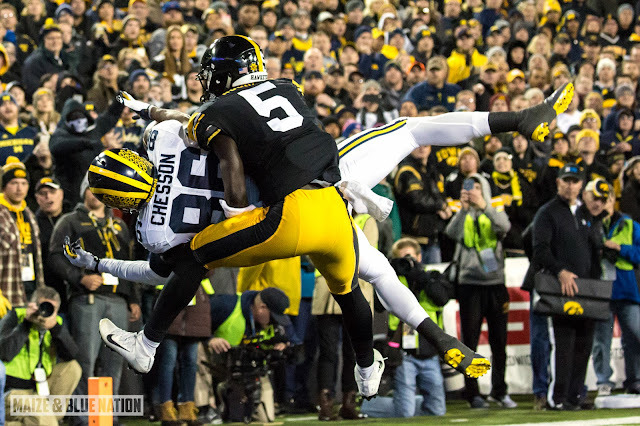 The issues that plagued them last night have seemingly been just under the surface all year, and last night Michigan just couldn't overcome them. Chalk it up to whatever you want. We'll find out what kind of team Michigan is and how well they can respond next week. Now...each week really is a championship game. Moving forward, Michigan still controls its own destiny. Win the next two games against Indiana and Ohio State and they'll be in the Big Ten championship game. So in a sense, this loss doesn't really hurt Michigan at all. Rankings at this point are meaningless. The hope is that this loss will act as a wake up call for this Michigan team, which has been on cruise control through most of their schedule this year.